I love this idea. We adopted a number of antique cameras from Pat’s uncle, and my dad has a rather impressive collection of his own. My dad’s sat on a family room shelf when I was a kid, and occassionally I’d get him to show me how they worked, but for the most part both collections just sit in a box. 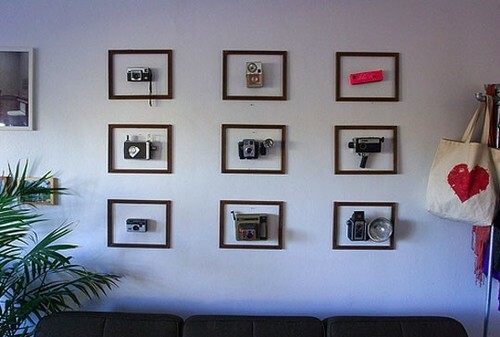 This display idea is so whimsical and fun– I love the playfulness of framed cameras, poised to take your photo. And look! A neon pink 110! p.s. After trying both, I’m declaring Vi.sualize the image bookmarking winner over We Heart It – it’s just much easier to sort and find images once they’re bookmarked. My Vi.sualize page of collected images is here.